I love soft pretzels. It probably goes back to my childhood in Philadelphia. My family would go to a Phillies game, and we would pass street vendors hawking soft pretzels out of carts on our way in to the stadium. These were not your typical soft pretzel, as they were baked in sheets, I think 6 pretzels per sheet. One pretzel was stuck to the next, with very little room for the holes. Each pretzel had to be torn from its neighbor when sold. They were more rectangular, but a deep brown and covered with coarse salt. They were about as good as it gets when you are 8 years old. Even better, when the game was over and everyone was leaving, the same vendors would sell the left overs for a couple bucks a sheet. We would buy up a few, and freeze them when we got home, and occasionally dole them out over the next few weeks. I am sure, in retrospect, much of my love for those pretzels comes more from the overall experience then just the taste, but that is definitely where it began. Now, however, when I buy a soft pretzel, I am usually disappointed. They look big, but are more air then dough, usually too greasy, and overall insipid. Sometimes covered with cheese, icing, or cinnamon sugar, and they have more in common with a Danish or doughnut then they do a pretzel. Not my cup of tea. So, I tried to find a good recipe for pretzels that I could make at home, and found one in Baking Illustrated. The moment I tasted it, I knew they had it right. The honey was the key. It gives a complexity that plain sugar can not match, but does not make the dough too sweet. However, I wanted to take this even further, and make a sourdough version. I find the sourdough adds an even greater depth of flavor, and the tart tang combined with the salty, toasty sweetness of the pretzel was just too good to pass up. It takes longer in time then the bakers yeast, so you do have to plan it out, but I think it is worth it. The following recipe will make 12 pretzels. 1 Tbsp of sourdough starter. 1. To make the starter, mix 1 tbsp of sourdough starter in 4 oz of room temperature water. Then add 4 oz of flour, mix, and let stand covered overnight in a warm place to ripen. I would say you want it to stand at least 8 hours, but 12 or more would be better. 2. After the sourdough starter is ripe, combine the remaining 12.5 oz of flour with 4 oz of water, 1/4 cup of honey, and all the starter in a mixer. Mix with a dough hook about 2-3 minutes, until the dough is starting to come together. Let stand, covered, for 20 minutes, so the dough can thoroughly hydrate. After 20 minutes, sprinkle the salt on top, and knead again for about 2 minutes until the dough becomes smooth. This is a pretty stiff dough, but it should start to form a smooth, elastic dough ball by the end of this step. 3. Put the dough in a lightly oiled bowl, cover with plastic wrap, and let it rise until doubled. This will vary depending on your sourdough. Mine will take about 3 hours in a warm place. Alternately, I have put the dough in a cool place, and let it rise slowly. My basement is about 55F in the winter, so I put it down there for a slow rise overnight. Likewise, you could let it sit on your counter for an hour, then put it in the refrigerator overnight, and let it warm up to room temperature when you are ready to bake. 4. Once doubled, put the dough on a lightly floured work surface. Degass the dough by kneading or folding it. Then cut into 12 uniform pieces. I just cut the dough in half, then into quarters, and each quarter I cut into thirds. 5. Take one piece of dough, and roll it into a long, thin rope. I try to get a uniform thickness, but I am not too worried about it. 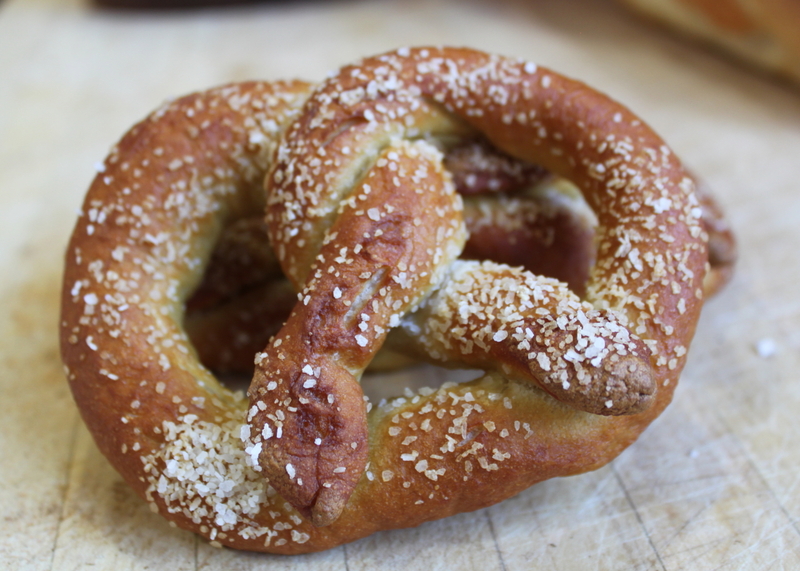 Variations in thickness give you variations in texture, which is part of what makes a pretzel fun to eat. The major point is to get the ropes fairly long. 20 inches or longer is ideal. The dough can be stretched a bit as well, just do it gently. If it breaks, just work the two ends back together. Don’t stress, this is the hardest part, but even if not perfect, it still tastes great. Next, you have to shape the pretzel. It is harder to explain it then it is to see it. Below is a short video from Canadian Living demonstrating how to make a pretzel shape. This video if for a sweet pretzel shaped cookie, so the dough is different, but the shaping is the same. 6. Once you have your pretzels shaped, use a 12 inch skillet or other large, shallow pan, and put the 6 cups of water in and bring to a boil. Add the 3 Tbsps of baking soda to the water. Once dissolved, add your formed pretzels to the boiling water. I do 3 at a time, so there is plenty of room for the pretzels to float. Sometimes they stick to the bottom of the pan if you don’t have enough water. Just scrape them off with a spatula. After about 30 seconds in the boiling water, flip them over and boil them another 30 seconds. They will puff up in the water, and likely will not rise anymore in the oven, so that is about the final size. This step gives them the great crust and the brown color. You really can’t skip it, it is the key to getting a true pretzel. Transfer the boiled pretzels to a baking sheet. You can bake them on an oiled baking sheet or rack. I have done both, and I prefer to bake them on a sheet. You get a chewier texture to the bottom of the pretzel that I prefer. You can also use a Silpat liner in lieu of oiling the sheet. My wife has one for baking, and I am lazy when it comes to cleaning up, so gave it a try. It worked great. An oiled sheet of aluminum foil should work fine too. 7. Let the pretzels dry a few minutes on the sheet before sprinkling salt over them. The surface will be tacky, but you don’t want it frankly wet. If it is too wet, the salt dissolves and you get the salt taste, but not the appearance. I use kosher salt, because it is what I have on hand. 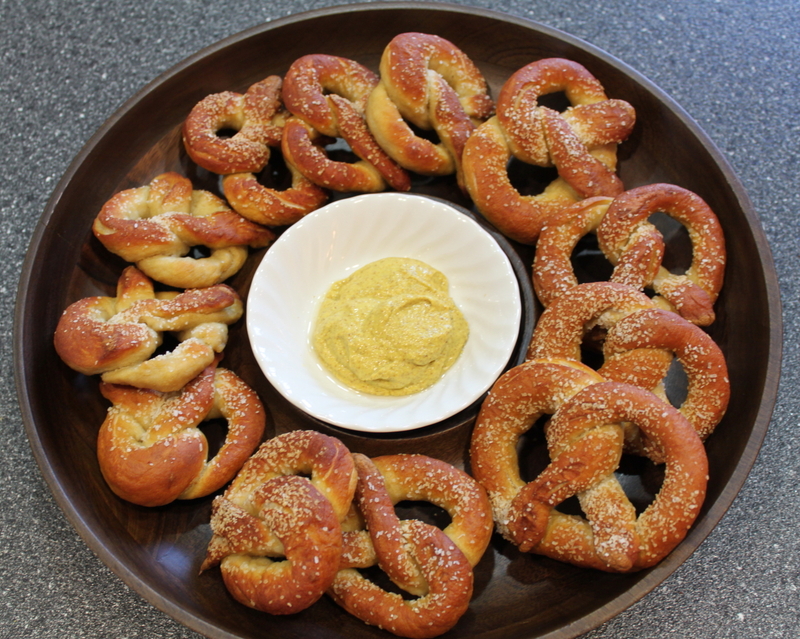 Traditionally, you should use pretzel salt, which is coarser, but the kosher salt works well enough I have not bothered. Put in the oven, and bake for about 12 minutes at 450F. They will turn a nice golden brown color. Remove from the sheet, and let them cool. You can eat the pretzels as is, or with mustard, which is my preferred route. They are best the day you bake them, but I have kept them in a ziplock on the counter for 2 days without a problem. I have no idea if they will last longer then that, because I have yet to have one survive longer then 48 hours in the house. My kids devour these things, and I have to keep them hidden or they disappear before I have had a second one! Sourdough Pretzels ready to be eaten!